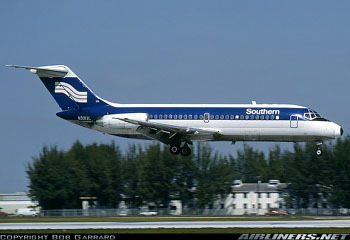 At approximately 4:19 PM Eastern Standard Time, on April 4, 1977 a Southern Airways DC-9 airplane, Flight 242, entered a severe thunderstorm at an altitude of between 14,000 and 17,000 feet near Rome, Georgia en route from Huntsville, Alabama to Atlanta, Georgia. Both engines were damaged and all thrust was lost. The engines could not be restarted. The crew attempted an emergency landing on a highway in New Hope, Georgia but the airplane crashed. Of the eighty-five (85) persons on board the flight, sixty-two (62) were killed, twenty-two (22) were seriously injured and one was slightly injured. Eight persons on the ground were killed and one person was seriously injured; one person died about one month later.